Encountering a turtle underwater is to be faced with a remnant from a time when reptiles ruled both land and seas. 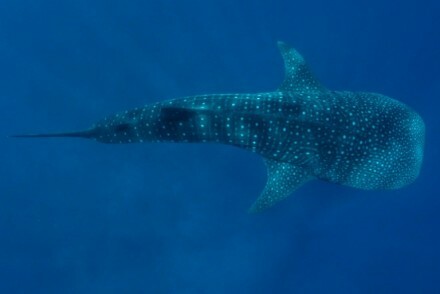 The experience is unforgettable and when diving in the Maldives, highly likely. Last year when preparing the Green Issue of Liveaboards of Maldives, the magazine team joined forces with the crew from MV Soleil to locate the best spot for sighting green turtles in North Male’ Atoll and to capture the perfect shot of these incredible creatures. When deciding on a wildlife focus for our green issue, our dive team didn’t have to search very far. Although somewhat misleadingly un-green in colour, the green turtle was the obvious choice. Its name of course was a critical factor in our decision as was its status as an endangered species. However, it was something far less conspicuous that quickly decided me. Alongside a couple of species of shells and the ubiquitous tuna fish, I had noticed that the green turtle was the only other representative of local wildlife on the Maldivian currency. Admittedly, it occupies a fairly humble position on the back of the 50 laari coin, the equivalent to about 3 US cents. However, despite having a multitude of species to choose from, the green turtle (or velaa, in Dhivehi) was elected. On this coin, burrowed in the pockets of every Maldivian, the green turtle occupies a position at the heart of the nation’s culture. Understandably so. Graceful and ancient, when spotted on a dive, a green turtle is always a highlight. A prehistoric leftover from a time when scaled animals dominated the planet, a turtle offers a glimpse of something primeval, something so highly adapted to its environment that it has survived unchanged for millennia. Although they are classified on Appendix 1 of CITES’ endangered species, these turtles are a familiar sight on Maldivian reefs. Thanks in large part to their protection under Maldivian law since 1995, the turtles here can find safe homes amongst the corals. Of the seven species of turtles that exist, five can be found in the Maldives. Of those five, it is the hawksbill and the green turtle that are by far the most commonly seen. Our objective was simple enough. 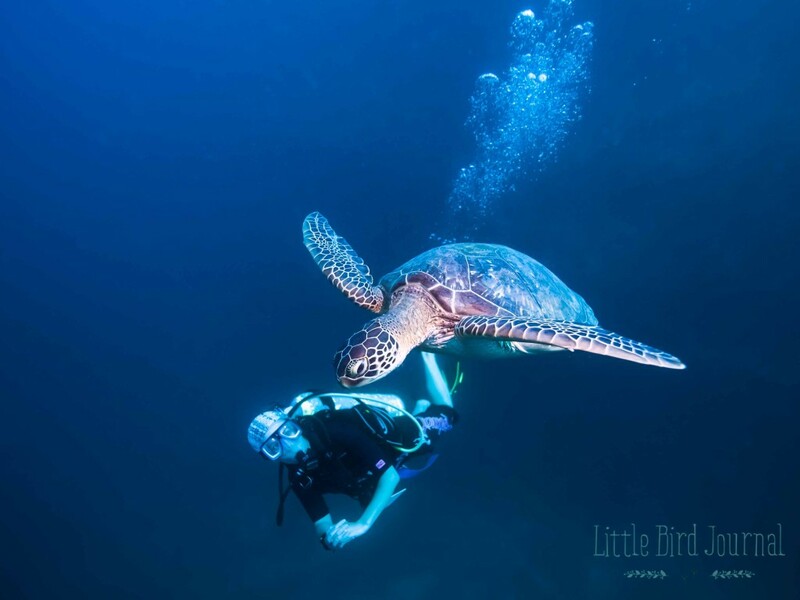 To locate the best dive site in North Male’ Atoll for seeing green turtles and once there, photograph these gentle beasts in their natural habitat. To achieve this goal, we turned to the Liveaboard Association’s Vice President, Shaad, for his help. 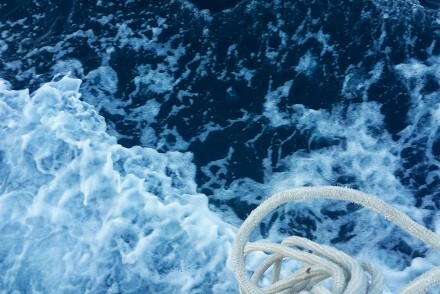 With innate Maldivian generosity, he unhesitatingly offered us the assistance of his liveaboard, MV Soleil. During a brief interval between trips, her dive boat would be ours for the day and her dive guide would take us to the turtles. We would have the day to locate the creatures and to get the perfect shot for the magazine. The feat seemed ambitious. Wildlife photographers often spend months on location to get the perfect shot. We had eight hours. 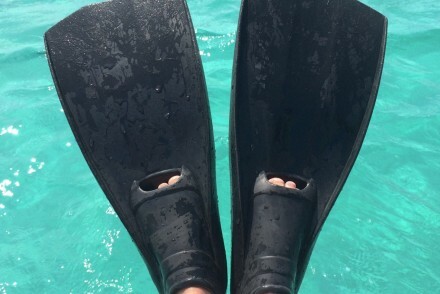 As with all my dive trips, in preparation I consulted my husband, Miuraj. A PADI staff instructor, he has a decade of diving experience in the Maldives. If we wanted to find green turtles in this atoll, he said, one spot above all others would give us the best odds: Feydhoo Wall. A quick survey of other dive guides I knew corroborated his opinion. 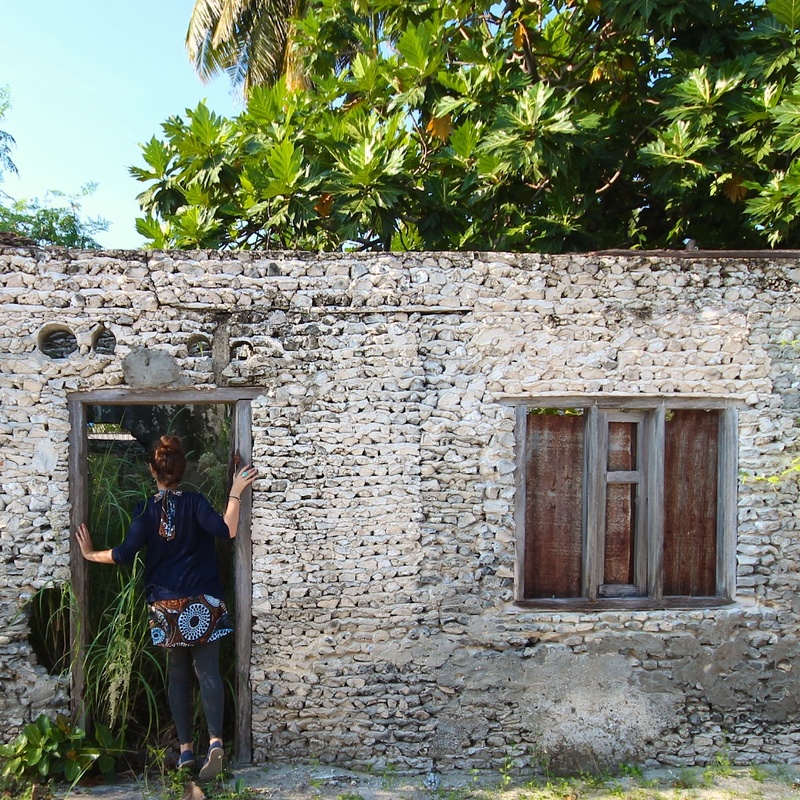 The imposing reef that plummets sharply down to 30 metres on the north side of the country’s disused prison island Feydhoo Finolhu is peppered with small caves and overhangs, which provide cosy resting spots for greens to doze. This wall was where we would head first. Eight-thirty on the following Saturday morning, we are greeted at Male’s main jetty by the crew of MV Soleil’s dive boat, headed by Aslam, the boat’s resident dive guide. Our dive team for the day is small; our in-house photographer Niyaz, Miuraj and myself. Nashaath, our hirsute art director joins us to oversee procedures from the surface. The weather blesses us with one of those perfect days that the Maldives is known for. The wind is strong enough to temper the sun’s intense heat yet subdued enough so as not to cause the sea to become choppy. Later on, as I descend for the first dive, I monitor the water temperature and notice that my computer reads 30°C until we are at 14 metres. No wetsuits needed here! We anchor opposite the island and begin to gear up. After only one maiden test run the week before, our photographer’s underwater gear is brand new. He assembles it nervously as we crowd him like witches around a cauldron. We jump. The current is mild and the visibility decent. The virtually 90-degree drop off gives the reef the appearance of a fortified castle, which is apt for an island that used to harbour some of the country’s most violent criminals. Sadly, these subaquatic fortifications did little to stop a significant number of inmates from escaping in dinghies. This ultimately led to the prison’s closure and the prisoners being relocated much further away from Male’ in an attempt to impede them from rowing to freedom. As with all places that have been all but abandoned, the island has a slightly eerie feel. The wreck of a large fishing boat left to rust at the edge of the reef does little to placate that feeling. As we begin our drift along this limestone wall, the activity along it is in sharp contrast to that at the surface. There’s a multitude of species here. Small porcupine and lionfish are in abundance. Parrotfish bring movement and colour. Large trevallies swim parallel to us in the blue. But they are not what we came for. After a few moments, Miuraj turns to me and jokingly gestures in diver sign language “Where are the turtles?” I look around and as I do I notice a small ledge about three metres ahead of me. Was that a head peering over the edge? I start madly pointing at the ledge and for a minute Miuraj thinks I’m continuing the joke but as we approach, large black eyes turn to face us. I look at my dive computer. It had taken eight minutes to find our first green turtle. Now for a photograph. Nestled on the coral shelf, at twenty-three metres depth, is a perfect specimen. Flippers spread wide, he surveys us as we approach cautiously from below. What makes green turtles such wonderful photography subjects is that they rarely lose composure. Their species resided amongst dinosaurs and out-existed them. When you’ve achieved that, there is not much that can ruffle you, I guess. As we continued to snap shots, I cautiously approach the turtle from behind to get into the frame. I feel like a tourist who, having spotted a celebrity, wants to get a picture without the star realising. Just as an A-lister might, Mr Green graciously poses for a couple of shots and decides it’s time to leave. We continue to drift and I spot three eagle rays in the distance and point them out. Everything down here seems so unhurried and poised. It is such a contrast to life back in the capital. Exactly two minutes later, we encounter another green at 30 metres. This fellow is smaller and more impatient than his elder. He allows us a couple of shots then relocates to another cave. As he does I swim for a brief moment above him and beat my arms in unison with his flippers. I admire the mottled browns of its domed carapace. For that brief moment as I come so close to wildlife in its natural habitat, time feels suspended. These turtles are breathtaking. Two more and we begin to ascend for our safety stop. We review photos on the viewfinder and high five each other. Things seemed to be going to plan. 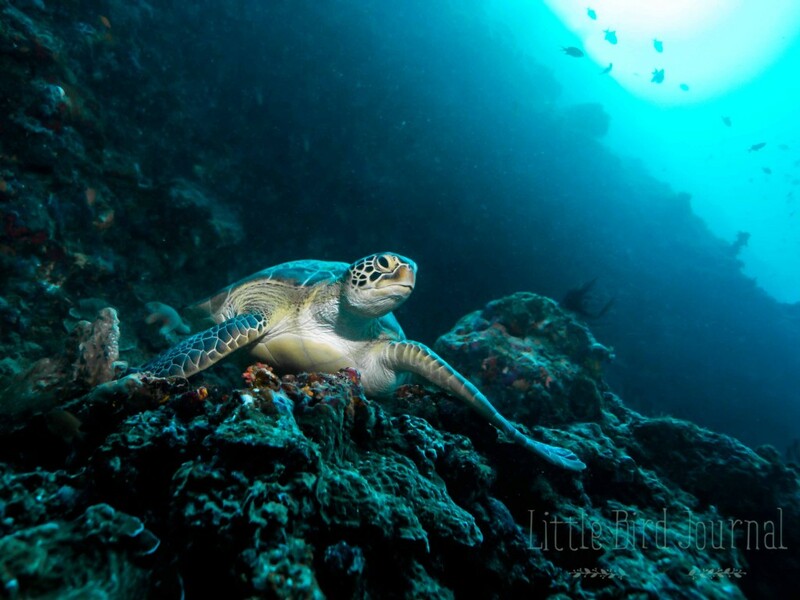 Another local photographer had informed us the night before that he’d been finding greens on the sandy bottom at a dive site called Back Faru recently. We thought we’d try our luck and cruised over during the surface interval. As we do, I quiz my colleagues on why they think the velaa was chosen to use on Maldivian money. Green turtles have always been embedded in local culture but for reasons that were anything but green. For many years, the meat of the green turtle was considered a Maldivian delicacy. Locals would fish for these beasts and roast them on a barbeque. Their exquisite shells were transformed into jewellery and trinkets for tourists to take home. I’m told that in the 80s you could even see foreigners board their return flights with a fully stuffed specimen under one arm. Luckily, things have changed. In the mid-90s the government brought all turtles under the protection of Maldivian law. What’s more, unlike in many other Southeast Asian countries, the black market is almost non-existent. Poaching is very rare and those turtle-shell trinkets have been replaced by convincing resin replicas. 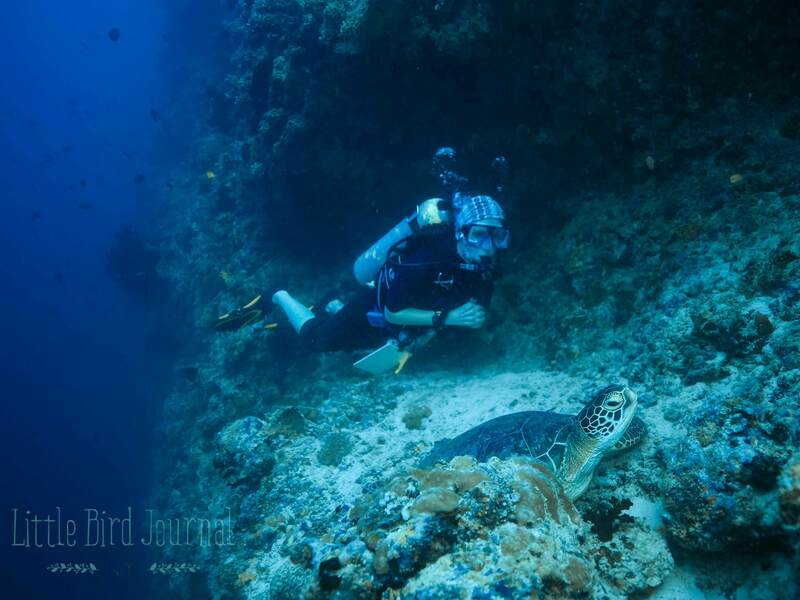 Diving is a lucrative industry in this country and the population was quick to realise that a turtle was more profitable alive than dead. Our second dive is less successful. The beautiful sloping reef is alive with life. Fish are abundant. For a few moments, we are encircled by a large school of fusiliers who swarm tightly as we beat our fins to make them dance. Aslam shows me my very first ribbon eel. All the while, we keep our eyes focussed on the sandy bottom but the greens aren’t here today. We surface and it’s lunchtime. We head over to where Soleil is anchored and join the crew. The boat is immaculate. Polished wood decorates the interior and creates a traditional, vintage feel. Over a lunch of grilled fish and octopus, we go over the photos. What had seemed so perfect on the viewfinder reveals flaws on a larger screen. Elements are blurred, the coral boulders camouflage the turtles and our bubbles conceal vital details. Our art director shakes his head. We still don’t have that perfect shot. We have one dive left and we have to make it count. We agree to go back to Feydhoo Wall, hoping it would treat us as well as it had in the morning. We make changes the camera settings, hoping this might make a difference. As we jump, we feel a pressure we hadn’t earlier. We descend and notice that the visibility had worsened since the morning. The current is stronger and the particles are more visible. I become concerned that we aren’t going to capture what we’d hoped for. My spirits are raised when we again encounter a placid turtle, chilling out on a ledge at twelve metres. We take shot after shot and he seems unperturbed. I examine him closely as I creep up next to him in his tiny grotto. What’s remarkable is that these creatures achieve the curious feat of appearing simultaneously graceful yet grumpy. As they swim, their elegance is astounding yet as they perch amongst the coral, they appear as old men sitting on park benches. Suddenly, this old man manoeuvres himself to take his leave. Miuraj, who had momentarily been holding the camera, shoots off, swimming backwards as he tries to stay ahead of him. An impressive stunt when you consider that turtles can swim at up to 3km per hour. We follow in pursuit. Further and further we swim into the blue until, when the turtle finally loses us, I turn around and I can no longer see the reef. Disorientated, my sense of direction tells me to swim back to my right. Miuraj on the other hand leads me confidently to my left and we soon see the security of the reef materialise before us. After two more sightings, Niyaz points to the camera and makes a slicing action across his neck. The battery had died. Our time was up. Later that evening, showered but exhausted, we begin to look through the pictures. We flick through quickly, anxious to see all of them. Image after image appears in quick succession. Then, one catches my eye. “Wait a second” I say as I start rummaging through my purse. 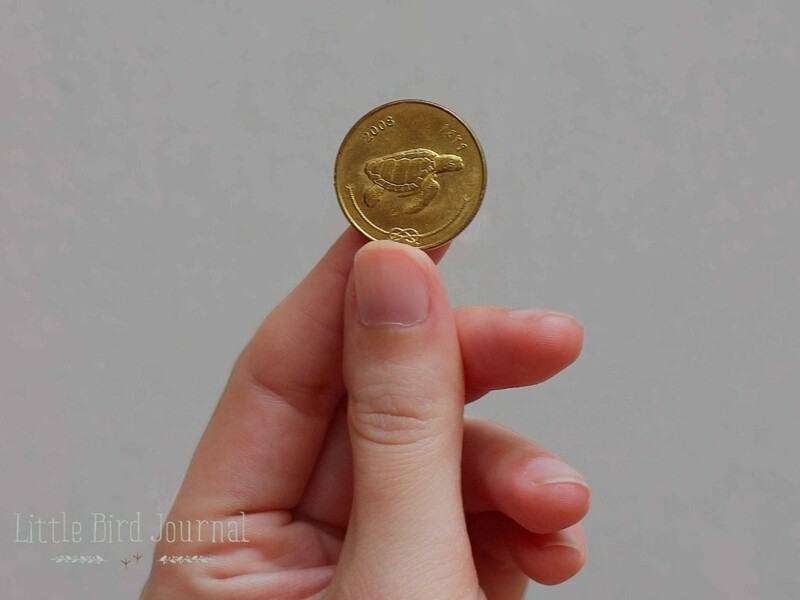 I pull out a grubby 50 laari coin and hold it up in front of the screen. It was a match. On that last dive, a few minutes before the battery gave up, having charged off into the blue, Miuraj had managed to capture an exact double of the engraving that had inspired me in the first place. 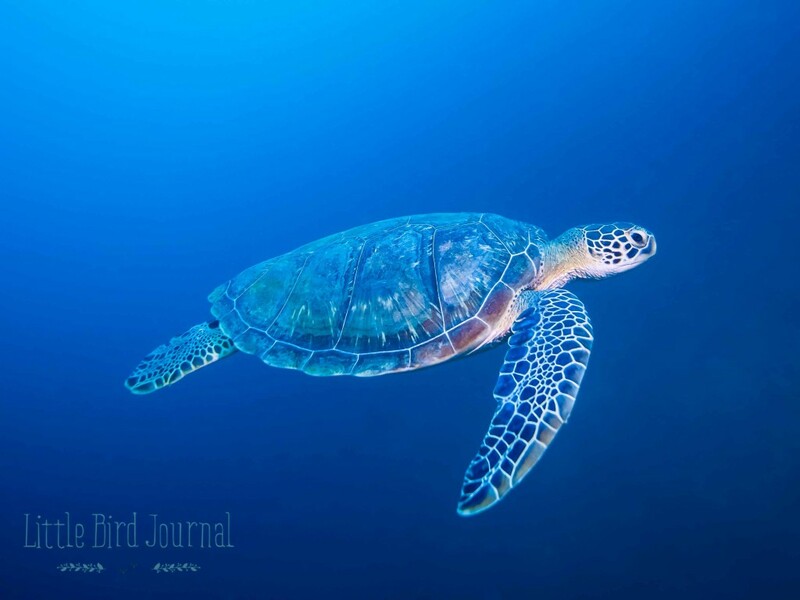 I look at the flawless, sideways portrait of an exquisite green turtle against a deep cerulean blue. This article was first published in the 2015 issue of Liveaboards of Maldives magazine. It was like reading a behind the scenes of a bbc series. So intense and beautifully written. It really was an amazing day. You take amazing pictures Miuraj! You are so gifted and patient, I had only seen one of these and I had never read this article. The two of you make a fantastic pair of reporters. I love Adeles style. A beautiful piece, and stunning photos too. Wonderful combination of outstanding photos and atmospheric text. Magic.